Mike’s dreams came true when he joined the Chicago Bears- a team he idolized as a kid. 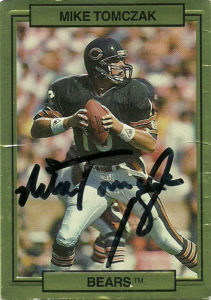 While Ditka put so much pressure on Mike that he considered quitting the sport he loved, Mike ended up carving out a 15 year career in the NFL playing at a variety of stops in the league after Chicago. Infamously during his stay in Green Bay he opted to hold out for a better contract- which caused the team to cut him, and brought about the Brett Favre era that much quicker. Mike had no problem spreading the love around, throwing to 35 different players in 88 touchdown strikes. While Mike only topped the 300 yard mark one time with the Bears, Packers, and Browns, he blossomed late in his career adding 3 more to his career with the Steelers. 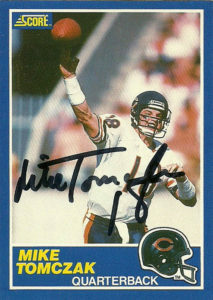 Mike is known for being the lead guitar player during the Bears infamous 1985 ‘Super Bowl Shuffle’ video. He also shares the same birthday with fellow quarterback Doug Flutie. 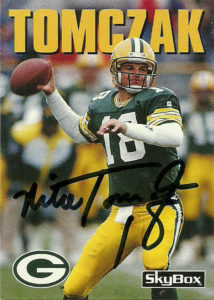 Tomczak had some great cards over his career. It took me some time to figure out which ones to send him. After some deliberation I decided on these three. I liked the design and photo for all three of these cards. Action Packed did a short run test promo in 1989 that covered a few NFC teams. It was pretty much identical to their 1990 run, minus the copyright. Score 1989 was blockbuster by any right with the vibrant colors and strong action photos standing out. Skybox was a late addition to the market, coming from the basketball arena, but its initial offering was simple, clean, and impressive.